These days, a social media marketing strategy is just as crucial for a small business as is a sellable product and a working phone line. Lots of entrepreneurs do not feel comfortable using social media, and others claim that they simply can’t find the time to share, read, and respond to social media posts. But there is a big problem with both of these excuses. 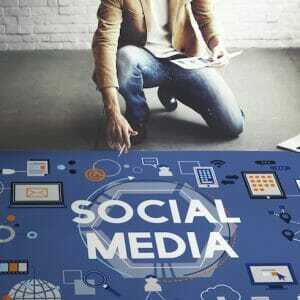 Social media is the single fastest-growing marketing method in the world right now. To forgo a social media marketing strategy is a careless way to lose many potential customers before you can even find them. Nearly everyone shops online now, and most people reach out on social media to find the products and services they want. Whether they are searching for a business type or asking their friends for input, folks are looking for your company on social media every day. If you don’t engage with your potential clients on social media, then your marketing strategy is utterly incomplete. We know you are busy and have a lot on your plate. But if growing your business is your goal, it’s time to stop making excuses and carve out some time in your schedule to ramp up your social media presence. 1. Your strategy for social media marketing should start with learning a thing or two about your ideal customer. This will help you determine which social media platforms they are using. A common error with social media newbies is that they think they need an account with every platform. Don’t do that! Choose two or three that your ideal customers prefer to use, and focus on those. 2. Once you have a group of followers paying attention to what you have to say, start listening to them. Pay attention to what they are interested in, what’s bothering them, and what problems they need to have solved. Find their itch, and then tailor your social media content so that it scratches that itch. 3. When people make comments on your posts, be sure to reply. Even the simplest engagements with your followers will generate more buzz about your product or service. People want to know there is a human being at the other end of that post. So be genuine and honest, and never let an opportunity to engage fly past you. 4. Get creative with the things you share on social media. Consider making a special offer to your followers. Try running a photo contest to get people sharing things on your account. Take a simple poll to learn more about what your business’s potential customers want or need. Did you notice all of these tools can be used discreetly to do market research? This makes it doubly useful to you. Social media marketing requires planning, strategy, and commitment. It’s not something you can set up and then forget about. Just like blogging is an ongoing process, marketing on your social media platforms calls for repeated effort and attention. If you think you could use an expert hand in setting up your social media marketing strategy, call PersistSEO at 770.580.3736.